Ford F-Series has been putting up some big numbers season after season. After all, it's been America's best-selling line of trucks for 37 consecutive years. 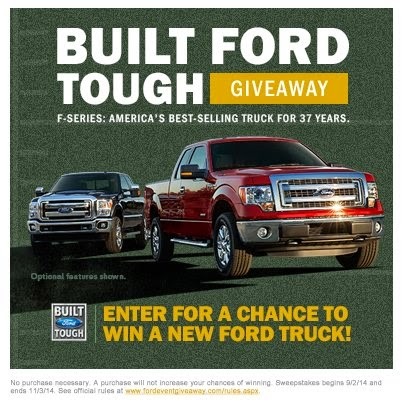 An now +Ford Motor Company is celebrating this championship year with the Built Ford Tough Giveaway. To enter for your chance to win, "Like" Heiser Ford Lincoln on Facebook, then click on the Built Ford Tough Giveaway Tabon the page to watch the truck videos and register! Want to increase your chances? Just watch more videos! Hurry! Because while the tough Ford trucks are built to last, the clock on the Built Ford Tough Giveaway runs our November 3rd. We would love to see a +Heiser Ford Lincoln client win!